Tembo, our 46-year-old African elephant is very curious. She loves to explore in her yard and it is not uncommon to find her rearranging her yard daily, moving logs and tires about. She accepts people easily and you can become her best buddy with a baby carrot. Tembo LOVES to paint. She will paint with both her trunk as well as a paint brush. It is not uncommon for her to paint on herself as well. She loves water, dirt, and mud. She will roll around in the mud coating herself from head to toe. She also enjoys sand bathing. 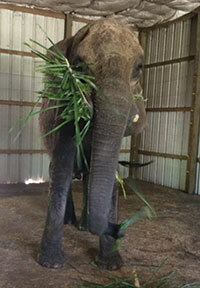 Tembo LOVES food! There are not many foods on the menu that she won’t try. Sunda, a 56-year old Asian elephant, has a delightful personality. 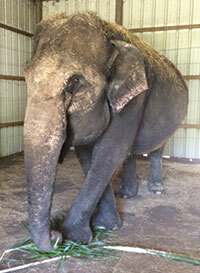 Sunda loves playing with Tembo. They have been together for 40 years and are like sisters. She enjoys music and painting. Unlike Tembo, Sunda could work on the same painting for hours. She will paint with the very tip of her trunk and creates masterpieces that are beautiful but rare. Sunda loves water and enjoys bath time. She will splash herself and those around her and blow bubbles in the water. Like any girl, Sunda enjoys a variety of perfumes especially citrus scents. On occasion, you can find Sunda squeezing or stepping on citrus fruit then spraying the juice on herself. 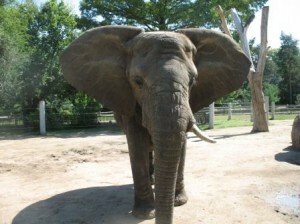 Shannon, a 34-year-old African elephant is disciplined and loves to be the center of attention. As with many adolescents, when she doesn’t get her way, she will sometimes sulk, dragging her trunk on the ground or sticking out her tongue. Her favorite toy is her blue barrel of which she carries with her wherever she goes. She enjoys treats, and her favorite is watermelon. When Shannon was 18 months old, she was introduced to Cora. Cora, who is now 58 years old, became an instant “mother” to Shannon. Thirty years later the two are inseparable. Cora is very passive. She will wait patiently for her turn. She loves attention and is very protective of Shannon. 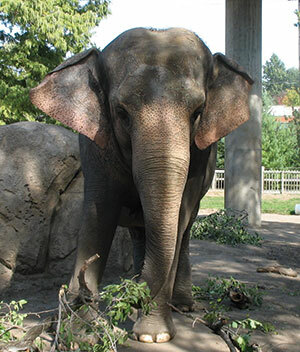 Cora is a very vocal elephant and can often be heard rumbling and trumpeting with delight.